Writers get ideas at oddest times. We will stare at a sentence wondering where to take our characters and not sure of the next step. Sometimes we will work on this for days, when all suddenly lightning strikes and we know what to do. That moment is often when we least expect it. For me, it happens most often in the shower. And I am not the only one. J. Michael Straczynski talks about having the same situation when he was creating Babylon 5. In that interview he mentions having two ideas: one of a epic space story and a smaller one consisting of a few people on a space station. He had the moment of epiphany in the shower when he realized they were one and the same. He got out of the shower, wrote everything down, and didn't use his computer because he was dripping wet. I've had more instances like this than I can count. But I discovered one big help a few years ago: Aqua notes. For years I had a pad of paper near the shower which always became a mess when I used it. To the point I rarely bothered. I tried to keep the ideas in my head until I got out and dressed. As you can imagine, a lot of great ideas went down the drain with that method! Aqua notes is a waterproof pad of paper and a pencil. Both have suction cups to mount in your shower. I prefer a space pen (which can even write underwater) to the pencil, but they include one and works well (provided the tip doesn't break). It is such a simple idea but really works for those writers with epiphany moments while under a warm cascade of water. While I had thought of getting a waterproof case for my Android tablet, this is a safer alternative and is always hanging in the shower ready for my next great idea. 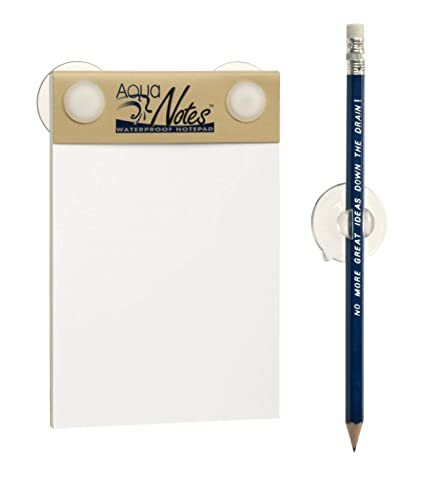 If you are tired of letting great ideas go down the drain, get Aqua Notes and put a stop to that today! It also makes a great Christmas gift for the writer in your family. Or just someone who gets great ideas at the oddest times!